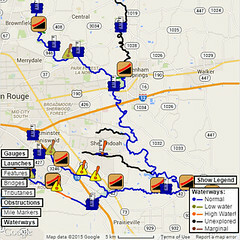 4.3 miles from Highland Road Park to Bayou Manchac. 24 blockages, most requiring small to moderate effort. 3 *MAJOR* blockages (10 yards or more of logjam). 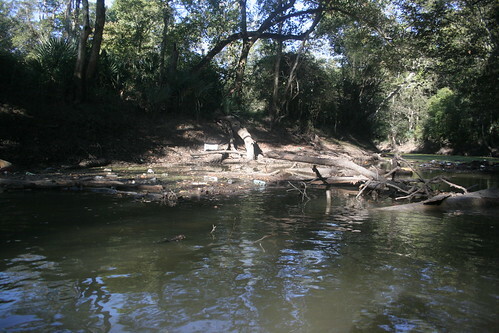 1 major litter raft (at blockage #7 from Highland Road Park). Back in January of 2012, Project Flowing Fountain broke through all the way to Bayou Manchac. It was a milestone showing what could be done, and we were happy to reach it. 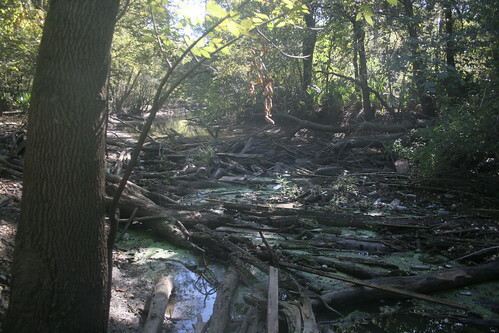 In the time that followed, however, we’ve been spending vast amounts of time and energy doing cleanups (most often on Ward Creek), and Bayou Fountain pretty much faded into the background. 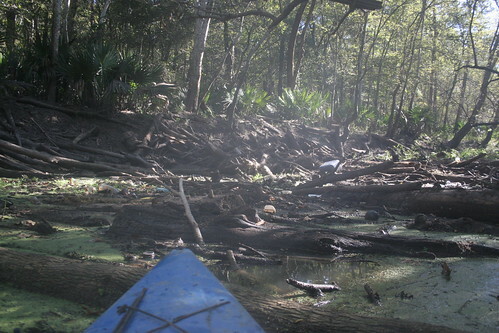 It’s just “easier” to do cleanups than to try to work meager connections to get improved paddle launch facilities. Well, we’re now coming up on the second “winter” since the original Bayou Fountain project, and we’re starting to feel a bit of change on the winds. We’re meeting more and more people on the water, and paddling seems to be gaining momentum. With cool weather approaching, it seemed about time to plan another major project to get Bayou Fountain open (and maintainably so). First things first, it was time to see what was out there. Two of us signed on for the mission, with the plan to hit the bayou early, just in case it was one of those very long days. 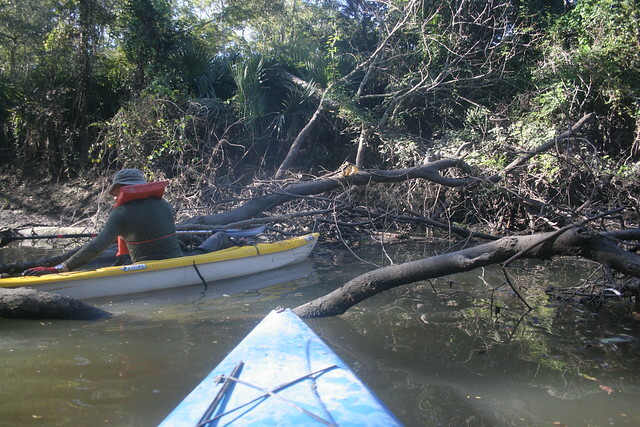 The plan was to launch into Bayou Fountain at Highland Road Park, make our way all the way to Bayou Manchac (one way or another), then paddle to Manchac Park for the exit. We staged a car (and an exit assist line) at Manchac Park, then headed back to the entry. The usual launch point we’ve used on many trips is still about the best option available, although it’s quite steep and unstable. We slid our kayaks down onto (into?) the mud flat, then slid down after them. It’s hardly the place to be if you don’t like mud on and in your boat, but it’s the best launch we have at the moment. We shoved off at about 8:40am. 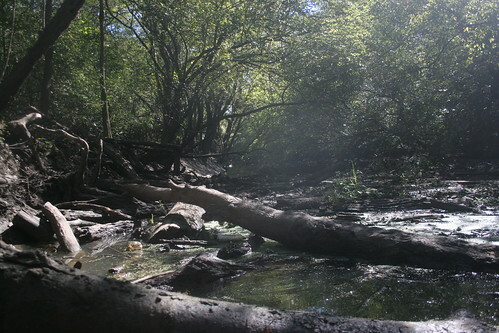 Blockage #7 (numbered heading downstream from Highland Road Park). We arrived here and found a huge raft of litter. I would venture a guess that this will easily fill the Canoemaran with a full load. It’s less than a mile from the launch point, and it’s in desperate need of some help. 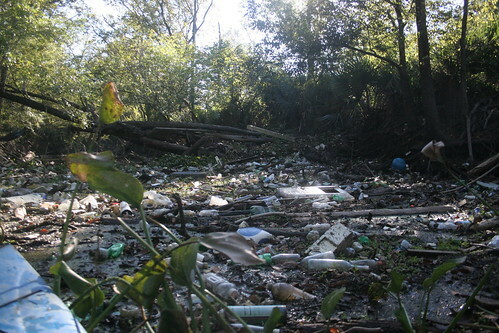 We should really have a cleanup just for this spot before we unjam the block, as we don’t want to send all this downstream. Stay tuned for pleas for assistance. Continuing down Bayou Fountain, the going was actually not that bad. There were only ten blockages in the first 2.1 miles of bayou, which is less than the 14 in that same section the first time through. There’s the one major litter raft (and plenty of smaller accumulations), but nothing that can’t be knocked out. Of course, just when everything seems to be going well, something big is sneaking up behind you. In a half-mile span centered on the upstream corner of the Country Club of Louisiana (where the power lines cross Bayou Fountain) are three *MAJOR* log jams. The middle one is the largest, at dozens of yards long and too many logs to count (lest despair take us). Each of these by itself will likely take a full day of concerted effort to force a way through. The first time around, we cleared just enough width for a canoe to slip through. This time, we’d like to get at least a two-canoes-wide path the whole length of Bayou Fountain (including through these three huge jams). It’ll help with keeping it clear, and it’ll let us get the Canoemaran through so we can collect the large objects found along the bayou. After the Big Three, we only hit a handful of blockages the rest of the way, most of them fairly easily cleared. 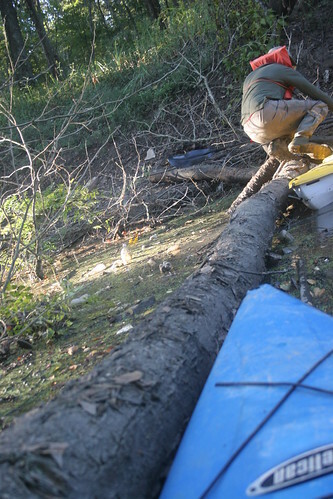 There was one more moderate litter raft, but likely not even two canoe loads worth. All in all, other than the huge litter raft at #7 and the Big Three (#11, #15, and #19), everything else seems almost straightforward. It’s going to be a ton of work (many tons, if you want to be literal), but it’s “manageable”. The first time around we had 37 blockages to work; this time it’s only 24. Next up with be the first trailblazing expedition of the project. We need to get the blockages open to get the Canoemaran to the giant litter raft at #7. Once the path is clear that far, it’ll be time for a litter run before continuing down the bayou. We’ll take all the help we can get when we get to the Big Three, human or mechanical. While there are fewer blockages this time, pulling enough to open a real path through the Big Three will make this a bigger project than the first time around.